Archeological research in the La Junta district has an illustrious early history. Charles Peabody of Harvard University was the first archeologist to visit the district, passing through Presidio, Texas in 1909 during a brief reconnaissance of the area. Next was E. B. Sayles of the Gila Pueblo in Arizona, who visited La Junta during a broad-based archeological reconnaissance of Texas in the early to mid 1930s. Neither of these researchers recognized the distinctive prehistoric villages later found within the district. But Sayles coined a name—the Jumano phase—to characterize a late agricultural culture that he surmised had occupied a swath of land along the Rio Grande from La Junta to El Paso. After he carried out a parallel reconnaissance of the Mexican state of Chihuahua the following year, Sayles sketchily defined an early historic Indian culture in northeastern Chihuahua—the Conchos phase. Although Sayles did not make a clear distinction between the Conchos and Jumano phases in relation to their content or chronology, these named patterns helped form a crude framework for the more substantive efforts that would follow at La Junta. 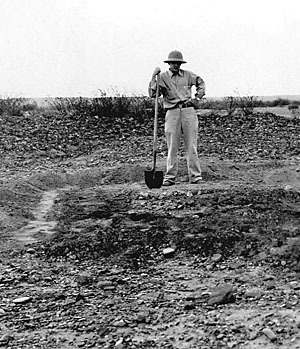 Immediately after Sayles published the results of his surveys in 1935 and 1936, archeologist J. Charles Kelley began to pursue a program of research in the vicinity of Presidio, Texas. Kelley was based at Sul Ross State Teachers College in Alpine, Texas, and he was also a fellow of the School of American Research, a private center in Sante Fe, New Mexico focusing on the archeology and ethnology of the American Southwest. In 1936 Kelley became interested in the findings of "amateur archeologist" and Presidio resident V. J. Shiner. Searching for artifacts, Shiner had dug a pit into an archeological site on the southeast edge of Presidio that was later named the Millington site (41PS14). Upon inspecting the pit, Kelley noted a buried lens of ash, charred materials, and burnt clay. He then carried out a brief excavation and found this lens to be the fallen remains of the roof of a circular pithouse. This discovery marked the beginnings of focused archeological research at La Junta. 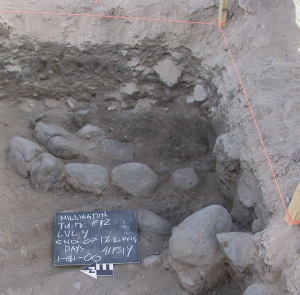 Shortly after the initial excavation at Millington, Kelley became involved in an innovative interdisciplinary project in the Big Bend sponsored jointly by the Peabody Museum of Archaeology and Ethnology of Harvard University and Sul Ross State Teachers College. The goal of the project was to "investigate the occurrence of human skeletal remains and archaeological materials in association with geological deposits." By correlating buried archeological components with the geologically recent (Quaternary) sedimentary deposits (mainly stream terraces) in which they were found, the researchers hoped to determine the respective ages of the region's archeological sites and work out the cultural history sequence. This project ranks as a pioneering example of the investigative approach known today as "geoarcheology," the application of geological methods and data to address archeological research problems. 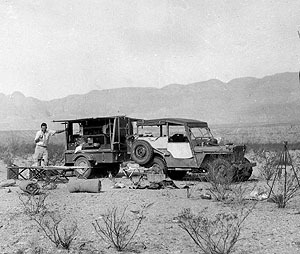 The Big Bend expedition was in the field throughout the first eight months of 1938. The project geologists, Kirk Bryan and Claude C. Albritton, identified three broad depositional formations within the deposits-from oldest to youngest-the Neville, the Calamity, and the Kokernot. 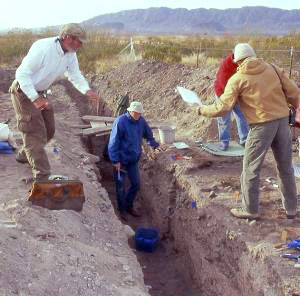 Meanwhile the archeological team, headed by J. Charles Kelley and Thomas N. Campbell (assisted by Donald J. Lehmer), conducted a broad reconnaissance program and carried out test excavations and more substantive digs at select open campsites with buried deposits throughout the Big Bend. The region was chosen because of the abundant evidence of relatively recent (over the last 10-15,000 years) geological activity—alluvial (water borne) and aeolian (wind borne) deposits and erosion. The walls of the area's numerous deeply eroded stream channels exposed both geological and archeological deposits. Kelley, Campbell, and Lehmer's work, in combination with the stratigraphic sequence developed by the project geologists, led to the first substantive synthesis of Trans-Pecos Texas cultural history. Kelley and his colleagues defined a long-term cultural pattern—the Bravo Valley "aspect"—for the La Junta villages and divided this pattern into five "foci" thought to span an 750-year period from about A.D. 1200 to the present. From earliest to latest these were: La Junta (Late Prehistoric agriculturalists), Concepcion (Late Prehistoric to Historic agriculturalists), Conchos (Historic agriculturalists), Alamito (Mexican period occupants), and Presidio (Anglo-American and Mexican-American occupants). An additional pattern, the Livermore focus, was coined to categorize the archeological remains of a distinctive group of foragers centered in the Davis Mountains area in the early to middle portions of what is today known as the Late Prehistoric period. All of these named patterns remain in use today, although the classification term "aspect" is no longer used, while "foci" are now called "phases." One of the sites investigated during the project was along Alamito Creek in eastern Presidio County about 14 miles from the Rio Grande. Named the Shiner site (and designated Shafter 6:1) the site contained a buried Bravo Valley aspect component thought to represent a La Junta phase (focus) village. They found and exposed several burned rectangular pithouses very much like some of those that would be uncovered a short time later at the Millington site. Today the Shiner site is still the only known Bravo Valley aspect site positioned an appreciable distance from either the Rio Grande or Río Conchos. Upon completion of the field portion of the Big Bend expedition, Kelley and Lehmer immediately launched a major research project at La Junta. From October,1938 through July, 1939, they carried out extensive excavations at two La Junta sites, Millington and Loma Alta (41PS15). The project was under the auspices of Sul Ross State Teachers College (now Sul Ross State University), with principal funding through the Work Progress Administration (WPA). Additional financing was provided by the School of American Research and E. B. Sayles of the Gila Pueblo. 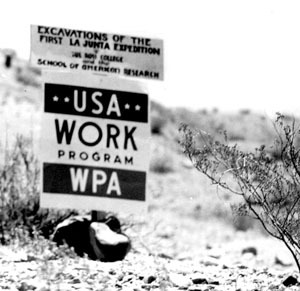 Unemployed men from the area provided the labor under the make-work WPA program. Lehmer was the field director for most of the excavations at Millington; Kelley took over this role for the last month at Millington and for all of the work at Loma Alta, a village located upstream several kilometers, almost directly north of the confluence of the Rio Grande and Río Conchos. During the extensive work at the Millington site, 21 houses were excavated; another nine were documented in trench walls. The efforts at Loma Alta were also substantial, as Kelley excavated, wholly or in part, 13 house structures and identified several likely plazas. Through these efforts a variety of construction techniques were documented for the La Junta, Concepcion, and Conchos phase pithouses. Rectangular and circular house traditions were found to be associated with all three phases, while a single adobe-walled pueblo with five contiguous rooms was linked to the La Junta phase. Unfortunately the work at these two important sites has never been completely analyzed and published. Kelley's efforts in the La Junta district formed the basis of his 1947 dissertation from Harvard University entitled "Jumano and Patarabueye: Relations at La Junta de los Ríos." Almost 40 years later in 1986 Kelley's dissertation was finally published essentially in its original form by the University of Michigan in recognition of its unappreciated significance. After completion of his dissertation Kelley worked at two additional La Junta sites in the late 1940s, and used Spanish colonial archival documents in the early 1950s to link the archeological record with written history. In 1948, Kelley conducted a reconnaissance on the Texas side of the Rio Grande between Redford and Fabens through a grant from the Institute of Latin American Studies of the University of Texas and with the sponsorship of the Department of Anthropology of that institution. Included with this project was excavation of several houses, including two rectangular pithouses at the Polvo site (41PS21) located downstream of Presidio near the small border community of Redford. 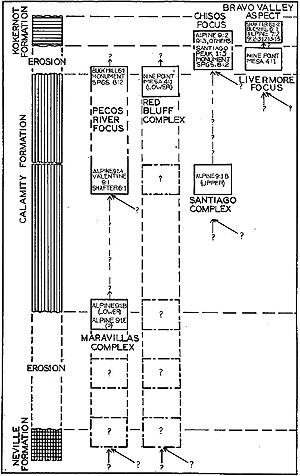 Based on the available evidence and other work in the district, Kelley assigned the most intact structure to the La Junta phase. The following year Kelley returned to Polvo as director for a University of Texas Anthropology Field School. This was the first formal field training course held in the Big Bend. Work was concentrated in the site vicinity previously investigated, but included some additional reconnaissance in the Redford area. 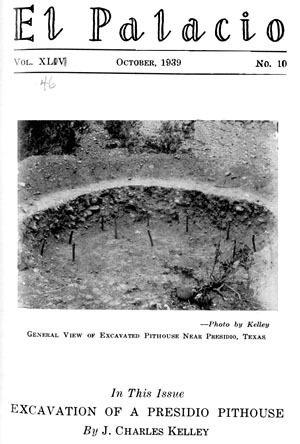 The excavation results were the basis for a 1951 master's thesis by William J. Shackelford, one of Kelley's students at the University of Texas. The field school participants uncovered an additional house structure—a large, partially intact rectangular pithouse—and nine floor pits, all of which were thought to be affiliated with the La Junta phase. Later in the summer of 1949, Kelley shifted his focus to the Mexican side of the Rio Grande and conducted a survey up the Río Conchos, from its mouth to Jimenez, Chihuahua. During the survey a site he named Loma Seca was discovered about a kilometer south of the Río Conchos and some eight kilometers southwest of Ojinaga, Chihuahua. Kelley's brief excavations at Loma Seca exposed a shallowly buried rectangular pithouse that had been burned. As with the pithouses at Polvo, this structure was assigned to the La Junta phase. While Kelley's work at Loma Seca brought a close to his substantive fieldwork in the La Junta district, he continued his research of the villages in the early 1950s through publication of articles delving into cultural ecology and ethnohistoric analogy, making use of both archeological and historical data. For instance, a 1952 article entitled "Factors Involved in the Abandonment of Certain Peripheral Southwestern Settlements," discussed the apparent abandonment of La Junta agricultural villages during two separate time periods, around A.D. 1400 and in the early portion of the eighteenth century. Kelley argued that both of these abandonment episodes were probably related to short-term seasonal or annual droughts that coincided with the intrusions of outside groups. He inferred that the first hiatus was associated with arrival of the Jumano and Cibolo foraging peoples in the region, while the second occurred when Apachean raiding groups pushed into the area. Kelley integrated historical data with geographical settings and known archeological sites in the region in two articles on the Indian pueblos of the La Junta district. These studies firmly linked the ethnohistoric record with the Concepcion and Conchos phases. Drawing on Spanish accounts, Kelley identified the archeological remains of most of the La Junta pueblos known to the Spanish, with the exception of certain of those along the Río Conchos which had not been verified in the field. This work breathed life into some of the sites in the district, allowing the archeological sites to be understood from a historical perspective. Following Kelley's extensive work in the La Junta district there was a long break before any substantive archeological research related to the villages took place. The first noteworthy effort occurred in 1973 and 1974 during an international flood control and channel relocation project when several burials at Loma Alta were salvaged by archeologists Vance Holliday and James Ivey from the Texas Archeological Survey of the University of Texas at Austin. About 10 years later reconnaissance efforts by the Office of the State Archeologist (OSA) of the Texas Historical Commission identified several villages in the Redford valley that had not been previously detected. The first excavations in a La Junta village in recent times were conducted by the OSA in 1994, under the leadership of Texas State Archeologist Robert J. Mallouf. In response to inadvertent damages inflicted to the Polvo site by the Soil Conservation Service during an emergency repair of the Presidio-Redford earthen flood control levee, archeologists tested several areas through hand-excavated units, cutbank profiles, and surface collections. William A. Cloud and others reported the identification of five cultural features, including a pithouse and a probable postmold (dark circular stain). The pithouse was radiocarbon dated to the middle of the La Junta phase, and the apparent postmold was found in an area of the site in which a Spanish mission dating to the late 17th or early 18th century may have stood. The next major excavation in the district occurred at a site along the Rio Grande between the Millington and Polvo sites that was tested and partially excavated by the Center for Big Bend Studies (CBBS) of Sul Ross State University prior to a highway renovation project. The site, which became known as Arroyo de la Presa (41PS800) was investigated under the direction of Cloud. While the site covered portions of several terraces of the Rio Grande, the excavations were confined to the relatively narrow highway right-of-way on the uppermost terrace. Archeological evidence was found of numerous prehistoric occupations dating between approximately A.D. 700-1650. Plant food processing was apparently of paramount importance in that portion of the site through time. Although the majority of data indicated use of the site by nomads/hunter-gatherers of the area, two pieces of daub (dried mud used to plaster jacal superstructures of the Bravo Valley culture) were recovered from a trash pit dated to A.D. 1040-1260. This suggests that the site area may have also been used by La Junta villagers and that as-yet unexcavated village deposits may lay nearby. The most recent excavations in the La Junta district took place at the Millington site in early 2006, the first effort there using modern analytical techniques. This CBBS project, also directed by Cloud, was initiated after several human interments were accidentally encountered during backhoe work in a roadway adjacent to the site. The CBBS archeologists concentrated their efforts on recovering the burials and testing three structural remnants exposed in the backhoe trench walls. Funded by the Texas Preservation Trust Fund (Texas Historical Commission), the City of Presidio, and the Trans-Pecos Archaeological Program (TAP) of the CBBS, the project resulted in the recovery of remains from five individuals (four adults and one early adolescent). The documented structures include a pithouse, a possible pithouse, and a previously undocumented structural type with a rock base. Radiocarbon assays suggests that the majority of these features date to the La Junta phase, the rock-based structure the notable exception. This atypical structure is thought to date to the Conchos phase or shortly thereafter. It is important to note that neither the burial nor structural data recovered from this project mesh seamlessly with Kelley's previous syntheses. Instead, the recent work suggests that the site, and by extension the La Junta district, represents a much more complex and dynamic situation than has heretofore been presented. In summary, the archeological investigations of the La Junta district have provided a wealth of information, yet most of the work was conducted over 55 years ago when archeological field and laboratory methods were relatively primitive by today's standards. Despite this very significant limitation, the quality of work displayed by the pioneering efforts of J. Charles Kelley and his associates is striking. Working in a remote area in the mid-20th century had certain advantages, two in particular. The archeology of the La Junta district was far less disturbed then than it is today. Fewer people lived in the area, relatively little development and land alteration had taken place, and very few people paid the slightest attention to the archeological remains in the area. The spectacular preservation conditions in the Big Bend region's dry rockshelters attracted the lion's share of the attention of collectors and archeologists. Equally important is the fact that archeologists of the 1930s and 1940s keyed in on architectural remains—especially houses. These they excavated quickly, but usually completely exposed. A house that might take several weeks or even months to properly excavate and sample today would have been excavated in several days back then. Consequently, Kelley and his associates were able to see the big picture and develop tentative understandings of the major patterns of La Junta archeology in ways that cannot be duplicated today. The downside is, of course, that the excavations were not documented very thoroughly and relatively few samples were collected and kept separate by provenience. For instance, materials suitable for radiocarbon dating, such as charred plant remains and animal bones, were rarely collected. Today such materials are also known to be critical for dating as well as understanding diet, climate, and environment. Another factor limiting the usefulness of the Kelley-era work is that the collections and records have not been kept together and some no longer exist. Surviving La Junta materials can be found at Sul Ross State University, the University of Texas at Austin, and Harvard University. Kelley kept many of his notes and photographs together and these are now housed at the Center for Big Bend Studies. But through the years the collections suffered, especially the WPA materials housed at the Museum of the Big Bend at Sul Ross. Recent and ongoing investigations have revitalized research of the distinctive La Junta culture, and when combined with the discoveries and insights of the early work, have the potential to give us a much better understanding of the mysteries and complexities of human life in this hot and arid setting. Some of the findings of new research are presented in the New Insights section. 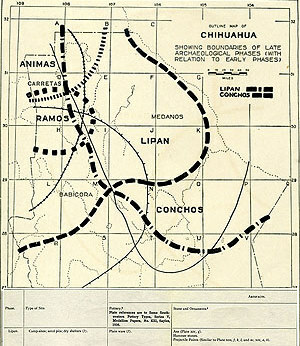 Map of the "late phases" defined by Sayles including the Conchos phase which he associated with "rancherias" (campsites) and "missions" as shown on the superimposed summary table entry. Adapted from Sayles 1936. Cultural sequence chart of the Big Bend area showing correlation between geological formations, Late Pleistocene and Holocene sediment deposits, and proposed cultural developments. From Kelley, Campbell, and Lehmer 1940, Plate 19. Kelley's first article on his archeological work at La Junta was the cover story for the October, 1939 edition of El Palacio, the leading journal of Southwestern archeology and history of the day. He reported his excavation of the first house he uncovered at the Millington site in 1937 and summarized the Bravo Valley aspect. This cover photo may be the only surviving image of the circular pithouse he assigned to the Concepcion focus. Kelley describes the structure in laudable detail and notes parallels with pithouses in both the Southwest and the Plains. 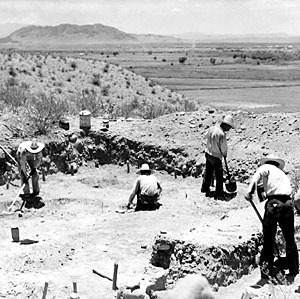 Excavations in progress in 1939 at Loma Alta under the direction of J. Charles Kelley. Center for Big Bend Studies Archives, Sul Ross. WPA sign posted at the Loma Alta site in 1939. The top part reads "Excavations of the First La Junta Expedition of Sul Ross College and the School of American Research. CBBS Archives, Sul Ross. J. Charles Kelley at his field camp during his 1948 survey along the Rio Grande in Presidio County. It was during this session that he recorded and first tested the Polvo site. CBBS Archives, Sul Ross. Outline of a burned rectangular pithouse exposed just beneath the surface at Loma Seca, a La Junta village site Kelley documented along the Río Conchos in Chihuahua in 1949. The young man is field assistant Thomas E. James and the photograph must have been taken by Kelley. CBBS Archives, Sul Ross. 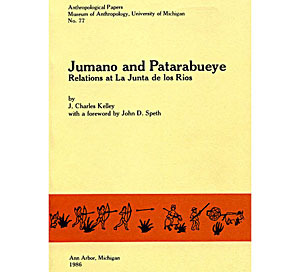 Cover of the published version of J. Charles Kelley's 1947 dissertation from Harvard University entitled "Jumano and Patarabueye: Relations at La Junta de los Ríos." The study finally appeared in 1986 in its original form almost 40 years after it was completed in recognition of its unappreciated significance. 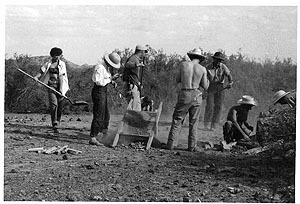 Excavations in progress at the Polvo site in the summer of 1949 by students at the University of Texas participating in a field school directed by J. Charles Kelley. This was the first formal field training course held in the Big Bend area and probably one of the first times that women participated in excavations in the region. CBBS Archives, Sul Ross. 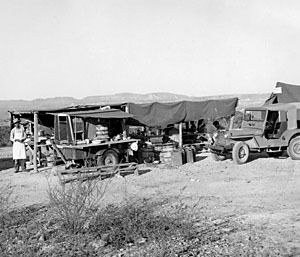 Field camp near Redford, Texas for the 1949 field school of the University of Texas at Austin. CBBS Archives, Sul Ross. 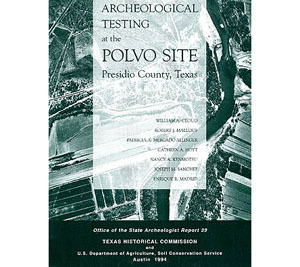 Cover of 1994 report on testing at the Polvo site by archeologists from the Office of the State Archeologist, Texas Historical Commission. This work represented the first significant excavation at La Junta since 1949. Excavations in progress at the Millington site in 2006. CBBS, Sul Ross. Cobblestone alignment thought to represent the lower wall or foundation of an unexposed structure. Charcoal found among the cobbles yielded a radiocarbon age estimate of A.D. 1730-1810. CBBS, Sul Ross.